Are you prepared for a disaster? Having a plan and organizing emergency drills is a great start, but it’s not enough. You need an emergency kit and unfortunately, not enough Americans have one on hand. The Federal Signal Corporation and the Safe American Foundation created a Public Safety survey in 2010. From the survey they found that more than half (54 percent) of Americans do not have an emergency kit. In this new year make a fresh start by putting one together. Portability. It’s best to have everything you need packed up and ready to go. Consider putting your supplies in a large duffle bag, a suitcase, or a box with wheels. Documents. Keep copies of important documents like insurance policies (medical and home) and extra identification in a sealed Ziploc in your emergency kit. Money. In a Ziploc bag keep a little extra cash in your kit as well as copies of your bank account records. First aid. You can buy a first aid kit at a pharmacy or make one yourself. The Red Cross says you’ll need bandages, gauze pads, a thermometer, aspirin, adhesive cloth tape and scissors and other medical aids. Tools. In an emergency you’ll need the right tools. The FEMA suggests keeping a map of your town in your kit. A battery powered radio, flash lights, pens, paper, and extra batteries are also a great idea. Question of quantity. 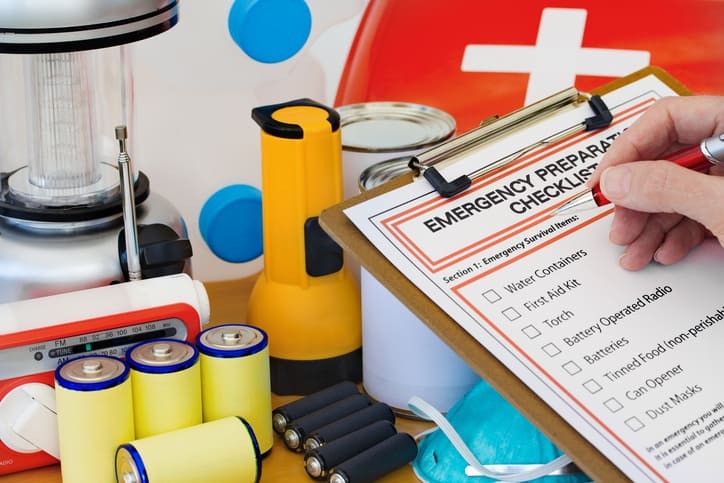 How much of supplies (especially perishables) will you need in an emergency? The FEMA suggests that you have enough to last at least 72 hours, just in case officials cannot reach you immediately. Stay hydrated. You’ll need lots of water for you, your family, and extra for your pets. Consider plastic bottles or water jugs. Food. The FEMA suggests keeping non-perishable food in your kit too. Try dried fruit, nuts, granola bars, and canned fruits and vegetables. Toiletries. Don’t forget feminine products and other hygiene items. Stay warm. Remember to pack extra blankets!